Anoraks on standby! As some of you will know, you can decode some Land Rover fastener part numbers into their actual threads & dimensions, like this: BT606106 = Bolt, 3/8 UNF x 1 1/4" Anyway, whilst perusing the S3 Parts book for a few bits and bobs I ended up down quite a rabbit hole and ended up making this: Land Rover / BL fastener part number decoder-o-tron It should get the basics right but I found a lot of previously un-mentioned variations in the parts book so if anyone has their anorak on and feels like filling in the blanks that would be super awesome. Areas of doubt & uncertainty: AB, AC, AD, AE, AR = Drive Screws (self tappers) but not sure on the differences AB,AC,AD imperial (AB6...) are by Screw No. (EG AB606... equals screw with imperial No.6 thread) but no idea of other thread-forms? AJ = Spire nut, not clear on details AK = Captive/spring nut, not clear on details AM = Bolt, "Special", no idea BD = Probably Blanking Plug but no idea on sizing? FX = Nut of some special sort (flanged or jam)? GG = Mudguard screw, only seen one part number so no idea on what's different about this MR = Pop rivet but no idea on size or type NC, ND = Castle nut but unclear on details NK = Captive nut / lokut / rivnut...??? NH, NM, NR = Nut, hex, not clear on detail NN, PN = Rivnut, type/details unclear NY, NZ = Nylock nit, not clear on difference PA, PC, PS = Pins, sizing not clear (very guesswork) RA, RF, RT, RU = Rivets, details unclear SA, SE, SH = Screw, differences unclear SF = Screw, Flanged, different to FS? TD, TE = Studs, very vague on details WA, WB, WC, WD, WP = Washers, what's the difference? WE, WF = Shakeproof washers, details / sizing unclear WK = Cup Washer, very vague on details WL, WM, WS = Spring washers, what's the difference? Adjust 300tdi pump timing without removing cover? In the time it's taken you to conjur that (bad) plan, you could have taken the front cover off. Why are you procrastinating? Capstan winch scratch build - CAD, 3D print and cast. Much progress over the weekend. One of the headache jobs was always going to be mounting the motor body to the gearbox, so no point sitting around waiting for it to make itself. I drew up a few bits in OnShape before cutting any metal. I don't have any CNC machines, but I do like making mistakes in CAD before I try making them in metal! Also useful for printing templates for drilling and cutting: The spray glue always makes them look funny, but it's enough to get some punch marks in for drilling: With two sided facing ops like this, you really have to have a clear idea of what sequence to do things in. These parts are beyond my 4 jaw chuck, so everything has to be done on a the face plate. Can be a pig to get it running true again if you flip the part around, so I ended up machining a morse taper adaptor with an 18mm parallel end to re-center the parts. Sadly didn't take enough pics as usual.... It's vital to get the datums for motor, tunnel and gearbox absolutely concentric and true, or the coupling will be put under serious strain without more flexibility added. As best as I can measure, I'm within .001", which I'm rather pleased with. You can see the machined location seat for the tube here: The plate locates on the shoulder on the motor snugly on the other side. The original motor mount plate. It's aluminium (where the main body it cast iron) and rather beaten up: Might as well replace it as I'm just going to machine a piece of steel anyway. More templates, punch, drill and facing work later facing work later yielded a beautiful fit: The original plate carries the oil seal and a shoulder to set the bearing pre-load: I can't push the oil seal in from the front because the tube will be welded to the front of the plate, so the seal has to be fitted from the back. This meant a two piece design with the shoulder being separate. Essentially, it's just a precision ring. Parts like this are hard to machine in a chuck, having critical dimensions front, back and outside. The only way to ensure this 100% is to machine those faces in one setup, so I chose to make an arbour to locate with a pre drilled hole: How it began life as a piece of plate: I took the roughing cut on the outside to see how accurate I could get it mounted on the arbour. Half a thou... that'll do me! And finishing the inside. It's just for clearance, so not critical, but I had one of those rare moments with the 4 jaw, where I eyeballed it true for starters as I always do, and the dial gauge told me it was perfectly centred. Sure it'll only happen once in my lifetime! It's a light press fit into the plate: To get the preload correct took a lot of measuring, and of course you have to take the gasket thickness into account, so I had to make that. Another CAD template: And on she goes. Hit it spot on: The moment of truth: Slips together like a glove. I deliberately left the tube locating pocket in the motor plate 3 thou oversize to give me some wiggle room if I hadn't hit something bang on. Allowing the shafts to align themselves gives a consistent gap all the way around, so I'm very happy. Once i'm sure I've not forgotten anything, I'll get it all welded together. Luckily with it being such thick plate, I don't think I'll have much problem with it distorting if it's suitably clamped. Famous last words The plates also need some finishing work as the edges are fresh from being cut. Then I really should paint it. I hate painting... Stay tuned! I made my own. I cheated a bit and used full sheets of WBP (marine ply) instead of individual boards to clad them, and built the internal frames with treated timber, all mortise and tenon joints. Nothing rocket science and didn't take too long to do. Here is my 300TDi re-power kit prior to fitting, fresh out of the factory crate (LR Genuine Parts). I agree, It's been a little while since I renewed the tank and fittings on my 110 and I think I remember how the fitting into the top (part 20 [NTC2156] on the picture below) of the tank didn't go that far down. I think it will either be pulling air from here or from the joints in the fuel lines. Worthy post on our informative forum. I cant remember if I ever knew that to forget it - but a handy tip - I expect it might have been part of the training course I did in the 80s. I do have some EP 90 its usually used in the wormdrive gearbox of my Skill 8 1/4 "circular saw - I expect that will be a novelty to many Carpenters, and electric circular saw that has to have oil changes! Well to start with the car seat fits in the 90 and I've reinstated the middle seat! My goal has always been to pop it back to Robs’s place. The patch of oil on the gravel has gone..
Let’s give a little space to inexperience: A standard Land Rover is amazingly capable off road - particularly with skilful driving. To use it as a daily driver you need to love it - they are noisey, usually leak water, really quite uncomfortable. To carry passengers you really want a 110 - long wheel base. They’re big - harder to park and I think harder to fit in with modern traffic. 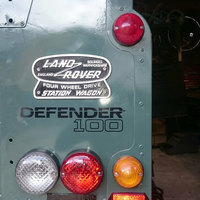 A lot of Land Rovers are in poor condition - many are like most tools, they’ve used and abused. I love mine, use it daily, and think it’s a great place to be. The main thing we need to know to help is to know your budget. 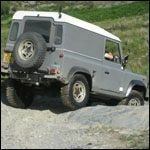 My suggestion would be, if your budget allows it, to buy the best condition standard Land Rover that you can afford - then use it. Where are you going to put the booster seat? Good. If we keep buying genuine, they might keep making them. Remarkable that we can still get a lot of parts genuine over 40 years after production stopped. I can’t answer your above question Mo but shop4auto parts do a stc639g made by Pro Flow for £50 don’t know if that make is any good , but says made in the uk and I’ve not used them personally yet but everything else I’ve had off there site has been good . Oh, and it isn't a rust bucket with a new chassis! About time I picked this up again. Life got in the way, as it does. To recap: Can't run a mechanical capstan on my 109 as the crank pulley of the V8 is way out of line with t'hole in t'front. The options are electric or hydraulic - I've chosen the latter. Why do I want a capstan? Because I can. Always loved the look on a series. Slight change of direction as I managed to pick up a cheap capstan drum from some sort of boat. It's the right size and will look the part with a cap made to suit: The Bonfiglioli 30:1 gearbox. Tis beefy: The gearbox will be mounted under the mounting plate which will carry an intermediate bearing, then the drum sits on top. The hydraulic motor. Another Ebay buy; an expensive (when new) old stock gerotor bargain. Better inside that it looks on the outside! Low speed, many torques. Perfect: I did some number crunching based on commonly accepted figures for aircon power consumption and came to the conclusion that an aircon electro-magnetic clutch should be man enough in my application. Seems insane, but it's surprising the amount of power an aircon compressor soaks up. I've no idea why I didn't take any pictures while doing that bit, but the front end of a Denso Disco V8 pump is grafted onto a 20cc/rev gear pump: It seems happy there and fits in the hole in the vehicle: It wants to slit slightly back from the main serp pulley, and I couldn't figure out a way to get some decent belt wrap even if I could get it further forwards. The solution is a separate short pulley, so I had to graft two together using a rotary table, a plasma cutter and some creative thinking: Sorry I didn't video it, I didn't have enough free hands. @dangerous doug has been kind enough to help me with a replacement pulley for my "spare" V8 to replace the one I cut up. Thanks Doug! I have yet to mount it all up properly, but it fits really nicely with a short 7PK850 belt. I'm working on a stiffener bracket to steady the rear of the pump too. Pics to come of both. The next challenge is the motor coupling. Trying to buy pre-made involute couplings is damn near impossible or very expensive. This seems to be a DIN5480 something with 14 teeth. I spent aaaaaages trying to find something I could buy cheaply and adapt. Eventually I resigned myself to having to cut my own. I don't have a shaper, mill, or a dividing head. Just an old Myford ML10 lathe. The tale is told on YoutTube! Sorry about the dreadful camera work. Having successfully cut the splines on my ghetto shaper/dividing setup, I machined some bits to bring it all together: And further pushed my little lathe to cut various keyways: Which, it has to be said, came out really well. I think I watch too many Keith Fenner videos.... I decided to test the whole setup. The lathe seemed to perfect power source: Much still to do machining up the gearbox to motor mount, cutting and creating the mount plate and suchlike. More as it progresses. I'm intending to have the drum removable so I don't have to drive around with a chuffing great bit of cast iron on the front of the vehicle all the time. All told, I'm having huge fun with this project, which is really the point, right? I had this exact same issue, unfortunately the photo in the previous post seems to have timed out, but I got there in the end. Now I attach a new photo in case some other numpty like me finds themselves in that same situation, have fun! A reasonably common problem with the 300TDi engine is failure of the 'P' Gasket. Name kind-of describes it perfectly. The gasket is sandwiched between the top of the block at the front of the engine and the alloy casting that supports the alternator, PAS pump, and water pump. There's a core plug right next to the gasket, so there's a chance this may have failed. Getting at both is the same method, and parts are very cheap. You need to remove 3 x bolts that also secure the water pump, so it's wise to replace that gasket at the same time - sods law being what it is, this will leak if you just replace the bolts with the old gasket. Signs of the gasket (or core plug) leaking. Dipstick tube is to the right. Top/front of the engine. Take off the oil filler cap, remove the black engine top cover, then replace the oil filler cap. Remove also:- Intercooler top hose Radiator top hose Thermostat/water pump pipe Disconnect bottom hose where it connects to the water pump, plus the heater hose that branches off it. While the belt is still on - slacken the 3 x 10mm head bolts that holds the pulley wheel to both the water pump and PAS pump. Belt tension will keep the pulleys still while you do this. Using a 15mm spanner - lever the belt tensioner to the left and remove the belt from all pulleys on the passeneger side of the engine. Then undo the centre nut of the tensioner and remove the whole thing. The stud came off with the nut, which actually makes access a bit easier, but it's not that important if just the nut comes off. The thermostat housing elbow has to come off too. The seal is a rubber ring, and removing two 10mm head bolts will release it. Alternator next - 1 x 10mm head bolt at the bottom, then one very long 10mm head bolt and 13mm nut at the top. Once free, the alternator can be laid out of the way with the wires still attached. Remove both water pump wheel and PAS pump wheel. It should look like this now. Unbolt the water pump - these three bolts pass right through the alloy housing, through the 'P' gasket, and into the block. They corrode and are very tight. Be careful you don't break them. If the heads round off, then hammer a 3/8" socket on and try again. Unbolt the bracket that holds the PAS pump, and let it sit down out of the way with the pipes still connected. Just the alloy casing to remove now - 1 10mm head bolt goes into the block, and another 10mm head bolt passes through the edge of the engine block and has a 13mm nut on the end. One 13mm nut is behind where the belt tensioner was. The alloy casting will now lift away, exposing the leaky gasket. The core plug I mentioned earlier is here. If you have any doubt as to it's condition, it might be wise to replace it anyway while you are there. The plug is very cheap, and replacing it now will possibly save you greif in the future. This is the alloy casting you just removed, you can plainly see where the gasket had been leaking at the top (black area) Carefully clean the mating faces, and even though I am using a new gasket I have still used a small amount of sealant either side of it, just to be on the safe side. New water pump gasket too, then re-assemble. The correct amount of anti-freeze back in the system, and that should be the job finished. The three bolts that pass through the pump, casting, 'P' gasket, and into the block will be very rusty. Clean them with a wire brush and coat with copperslip grease or similar. Once the belt is back on - use it's tension to tighten the bolts for the two pulleys. Les.